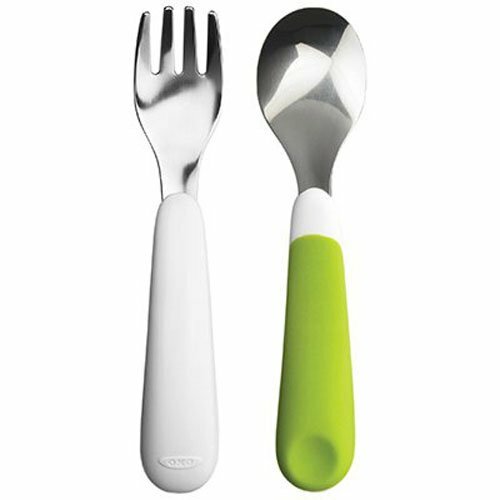 These toddler spoons are also great because the angled handle is ergonomic. The little holes in the spoons help to prevent food from falling off. Honestly, I wish my spoons were like these! So far, Theo loves using them. We got this set (bamboo stay put suction toddler divided plate + spoon) from Avanchy because it was recommended by another kid food blogger. I love that it's sustainable. We haven't used the plate that much, to be honest, but Theo LOVES the spoon. It's his favorite. A few other utensils / brands recommended by my mommy and me teacher at Babygroup include Num Num Dips and Oogaa. Additionally, moms from other Babygroup classes have recommended the utensils below. Although we haven't used any personally, they look great and seem like a fun way to using utensils at mealtimes even more enticing. They are mostly appropriate for early toddlers, ages 12-15 months. After further research online, I discovered that Fred and Friends has so many fun options! This set comes as a bunny and carrot (nesting), rockets and a plane! We have an ezpz mat (pictured below) that we haven’t used yet, but I can say that many friends of mine love it. 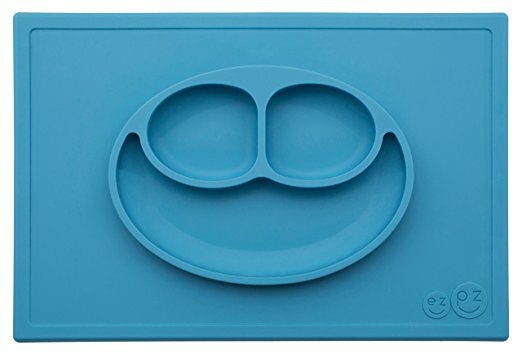 The mini mat could also be good to use on top of a high chair tray. This Fred and Friends plate is awesome, too, and it comes in a bunch of styles. It's like a board game with little compartments for food! We still use these Baby Bjorn bibs. They are fantastic and I have no plans to switch anytime soon. We also still use these suction bowls from time to time. The suction isn’t the best, especially if your baby's tray is a little messy and slippery. Nonetheless, I believe it’s good to introduce some sort of bowl that your toddler can experiment with. Theo often picks his up and tries to drink out of it, which is hilarious to watch! You can use these bowls for dipping, which toddlers love doing. We have quite the collection of straw cups now! Too many. :/ One of my favorites is the Thinkbaby straw cup, which comes in plastic and stainless steel. It is great for milk, smoothies and water, and is easy to take apart and clean. Theo also really likes these Nuby straw cups (pictured at right), which I find are better for use at home than on the go. The thick straw makes them great for smoothies. They're very easy to take apart and clean. I do NOT recommend the Munchkin Click Lock Straw Cup, which we used for a little while. It is quite difficult to take apart and clean! You actually need to remove the plastic flip piece to take the straw in and out for cleaning. (It took me a long time to figure it out.) What a pain. 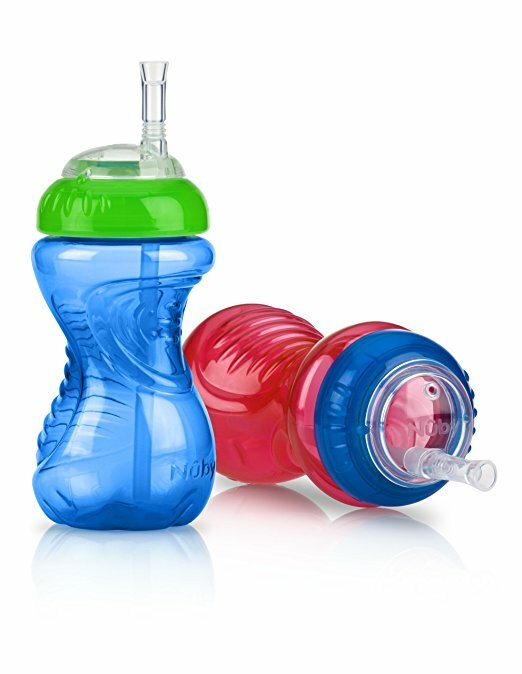 We still like Munchkin's weighted straw cup, which seals really tightly and is good for on the go. We have the Munchkin Miracle cup, which we need to try again. Theo just didn't get the hang of it before. What are some of your favorite items for mealtimes with toddlers? Please share with us in the comments!